The settlement addresses modifications Cemex made to its cement plant without obtaining the proper permit, as required by the Clean Air Act. Major sources of air pollution are required to obtain permits which require the installation of pollution control technology before making changes that would significantly increase air emissions. The settlement ensures that the proper pollution control equipment will be installed to reduce future emission levels. Cemex will install state of the art control technologies that will reduce annual emissions of NOx by approximately 2,300 tons and SO2 by approximately 288 tons. In January 2009, Cemex agreed to reduce emissions and pay a $2 million fine to settle Clean Air Act violations at another one of its cement plants located in Victorville, CA. The webinar conducted for cement companies on February 9 produced the loud and clear message that there is no time to waste in addressing the requirements of the new air toxic rule. The cement industry emissions are unique in the wide quantity variations from plant to plant. There are also aspects to the cement process which create challenges not experienced in other applications, so all will not proceed smoothly as the first generation of systems goes into operation. This means that time will be needed for fine turning. Karl Wilber, PE, General Manager of Tekran Instruments, identified the specific challenges facing the Portland cement industry as they further develop their strategies in response to EPA’s MACT regulations. The presentation included emissions limits and CEM parameters which are integral to MACT compliance with focus on mercury (Hg). Tekran shared their experiences in the cement, power, steel and incineration processes, the company has supplied a number of mercury CEMS to the power industry and is presently quite active in the cement industry. Because of its work with analyzers on a broader basis it has an understanding of the fate of mercury. This is important because removal from the air is only the first step. Prevention of mercury problems in soil and water are equally important. Another need is the use mercury CEM as a control device to regulate the quantity of sorbent injection. This will dictate a measurement both before and after the control device. Because of the large difference in range to measured and other factors, it is probably best to install a separate analyzer rather than to use two sample lines and one analyzer. Dan Kietzer, Business Development Manager at Sick Maihak, Inc. Process Automation Division, enumerated the monitoring techniques for compliance with the MACT rule, specifically, the measurement of HCl, PM and Hg need special attention. Sick Maihak is well positioned to supply the entire range of monitors needed to meet the new MACT standards. The company has considerable experience with various types of mass particulate monitors. The selection is dictated by whether the gas is wet or dry. One critical aspect is the calibration requirement. Dr. Ronald R. Landreth, Technical Business Development Manager at Albemarle Corporation Mercury Control Division, offered an Alternative Method of Hg and THC control using existing cement kiln particulate control equipment. Albemarle has pioneered the development of a control technology that focuses on the use of the existing particulate control equipment in cement kilns rather than the addition of a polishing or secondary baghouse. This is made possible by the development of a cement friendly sorbent for mercury capture. This sorbent is both efficient and cost effective. Keep up with the latest Cement MACT developments on the free website. There are hundreds of pages of insightful information for the cement industry on the free site at www.mcilvainecompany.com and then under FREE NEWS AND INTERWEBVIEWS. You can find all the information since October 2010 under Cement in the application search. Also you can click on the data prior to 2010 and then follow the green sign to the cement application link. There is also a good summary route as of February 1 through the following. There is a hold on a permit application filed by Lehigh Cement Co. for its Evansville plant in Maidencreek Township, PA.
Berks County Commissioner Mark C. Scott, said the company has added substantial pollution controls at the plant, but under the new permit wants emissions measured plant-wide on an annual basis. “That means the plant could have spikes in the level of pollutants for hours or days as long as it does not exceed the total amount allowed by regulation in a year,” he said. Liberty Environmental Inc., consultants hired by the commissioners to review the plan, concluded in its report that the levels for nitrogen oxides and fine particulate matter would be too high under the new permit. Commissioner Christian Y. Leinbach said he wants to make sure public health or safety isn't jeopardized, but he doesn't want to impose additional requirements on the company when the new permit actually would reduce the 433-ton annual output of pollutants by 130 tons. The new permit would consolidate several other permits. The company in written points to its voluntary reduction in overall emissions, states that the company would continue to use and maintain air pollution control systems. Five state attorneys general are pushing back against congressional Republicans' efforts to block the U.S. Environmental Protection Agency from regulating emissions of toxic mercury from cement kilns. The top lawyers from New York, Connecticut, Delaware, Maryland and Massachusetts urged Rep. Fred Upton, the Michigan Republican who chairs the House Energy and Commerce Committee, to withdraw efforts to undo the cement plant rules. New York has the Lafarge plant in Ravena, the Holcim plant in Catskill and the Lehigh Northeast plant in Glens Falls. Collectively, these three plants discharge roughly 170 pounds of mercury emissions into New York's air each year — about 20 percent of all mercury emitted annually in the state. Anticipating the new federal mercury rules, the NY state Department of Environmental Conservation last year imposed the first-ever mercury limits on the Lafarge plant as part of a renewal of its federal air pollution permit. The federal rules would impose even greater reductions. In 2007, the same five states successfully sued the EPA for failing to include mercury limits on cement plants. The popular Environmental Workshop held last year will be continued this year with a new set of current topics relevant to challenges we are facing. In addition, tutorials and technical papers drill down to focus on topics of most concern to you and your company’s operations. You can see a list of exhibitors at the following site. Dust Collector Performance Concerns and Prediction Monitoring: Can Modifications to Existing Equipment Meet the New NESHAP Performance Expectations? Moderated by Fred Schoeneborn, EPA Energy Star, formerly Global Facilities and Energy Management Coordinator for Mobil Corporation. How Green Is Your Lighting? The Need for an Engineered Refractory Solution to Provide for Improved Plant Reliability: This tutorial will focus on the design of monolithic refractory structures, non-destructive testing techniques, and failure mechanism analysis. Analysis for the Design of Electrical Power Systems: This tutorial will include: an overview of electrical power systems studies and methods, load flow and sizing of MV feeders and motor starting studies, short circuit studies and equipment evaluation, over current protection/time current characteristic coordination studies, protective relaying applications, NFPA 70E 2009 overview, arc flash analysis, and harmonics analysis. Gebr. Pfeiffer, Inc. was recently contracted to supply the SLS 800 BK High Efficiency Separator to Cementos San Marcos in Cali, Colombia. As a newly established cement company, Cementos San Marcos invested in a second-hand Raymond coal mill. The High Efficiency Separator will upgrade the refurbished Raymond coal mill, providing better product fineness, increased mill capacity and improved efficiency of the milling circuit. This order reflects the confidence Cementos San Marcos has placed in Gebr. Pfeiffer, Inc. as it follows another recent contract for a new MPS “Swing Mill”, which will be installed at the same plant in 2011. Cementos San Marcos SA is owned by a consortium of shareholders and companies; The Family Otoya Dominguez, The Family Cobo, The Siderurgica de Occidente SIDOC S.A. and CSS Construcciones SA. The plant is located near the company’s limestone and derivatives quarry in San Marcos, approx. 10 miles from Cali, Colombia. TurboSonic Technologies, Inc. has been awarded a US$1.2 million contract for design and supply of its ammonia injection technology for selective non-catalytic reduction (SNCR). The equipment was ordered by a South American Cement producer for four of its facilities, with delivery scheduled during the current fiscal year ending June 30, 2011. CEMEX UK replaced more than 52 percent of the traditional fossil fuels used to heat its cement kilns with alternative fuels during 2010, up from 45 percent in 2009. This saved the company nearly 194,000 tonnes of CO2 over a twelve month period across its cement plants, or, the equivalent to saving the CO2 emissions generated by around 77,000 cars in a year. In the UK, CEMEX uses alternative fuels at its cement plants in Rugby, Warwickshire and South Ferriby, North Lincolnshire. These used 49 percent and 67 percent alternative fuels, respectively during 2010. The alternative fuels used at Rugby are Climafuel and chipped tyres, and Climafuel and secondary liquid fuel (SLF) at South Ferriby are used. Climafuel is derived from household and commercial and industrial waste which is diverted from landfill and processed through a Mechanical and Biological Treatment plant. Secondary liquid fuel is made from industrial liquid wastes that cannot be recycled, such as paint thinners, inks and varnishes. Vice President of Cement Operations for CEMEX UK, Carlos Uruchurtu says, "The use of alternative fuels also helps to reduce waste sent to landfill. In CEMEX's case, more than 300,000 tonnes of waste that would otherwise go to landfill was used to fuel the kilns in 2010. "We did well in 2010, but are looking to increase the use of alternative fuels further in the future. While 100% replacement would be a challenge in the immediate future, it should be our goal, subject to public consultation and permit approvals, as well as capital investment and continuous improvements in the waste derived fuels supply chain." While South Ferriby has permission to use 85 percent alternative fuels, Rugby hopes to secure the permission to use 65 percent alternative fuels on a permanent basis later this year. Recently the last section of rotary kiln of Heidelberg TULA Project in Russia, which was contracted by Tianjin Cement Design & Research Institute Co., Ltd., was installed and the rotary kiln completed. Located in TULA, 160 kilometers south of Moscow, TULA Project is the first cooperation on cement production line between TCDRI and Heidelberg Cement Group in Russia. The rotary kiln is produced by Cemteck (Xuzhou) Heavy Machinery Ltd. Since 2007, Hindustan Unilever has been sending expired shampoos, powders, creams and assortments of other products to ACC's Kymore cement plant, near Jabalpur. Over the past four years HUL has hauled 13,700 tonnes of its waste products to ACC's plant "HUL's trade rejects, have replaced 0.3 percent of the total heat requirement. ACC, of Switzerland's Holcim Group, with 16 plants and an installed capacity of 26 million tonnes of cement, has acquired a degree of expertise in co-processing even hazardous waste like no other Indian company. It has set up an AFR division to oversee this activity. The company has invested Rs8 crore in four laboratories for AFR testing. It is also endeavoring to build a countrywide co-processing ecosystem by working with various stakeholders —industry waste-generators, NGOs, municipal bodies, and also the government. "We look at this activity from two perspectives: sorting out issues around waste disposal, which is a menace to society, especially to a growing economy like ours," says Ulhas Parlikar, director-AFR business, ACC. "And, of course, from the value addition and cost benefits that accrue." In 2009, the AFR push saved Rs41 crore for ACC, up from Rs22.8 crore in 2008. Last year, ACC consumed 22,000 tonnes of waste-paint sludge, refinery sludge, spent alumina, plastics and old tires, among others in its kilns as alternative fuel. This excludes flyash and slag, which account for 6-7 million tonnes and are known as mineral components in cement parlance. The Indian cement sector, led by ACC, is beginning to scratch the surface of the potential of alternative fuels. The thermal substitution rate at ACC, the amount of energy used from alternative fuels as a percentage of the total energy used from coal and other sources, is 0.59 percent. The substitution at UltraTech, an Aditya Birla Group company, is 0.47 percent, through the use of biomass fuels. For cement makers in the U.S., the figure is around 25 percent. Europe has a better record, with Switzerland achieving 47 percent thermal-energy substitution, Norway 45 percent and Germany 42 percent. India generates over 4 million tonnes of hazardous waste every year; municipal solid waste is at 40 million tonnes; other non-hazardous industrial and agriculture waste stands at 400 million tonnes per annum. "Hazardous waste generated can be three times more than the official figures," says Parlikar of ACC. Their disposal in an 'environmental-friendly' manner is an issue. Iran will invest $500 million in the construction of a 1 million ton/yr cement plant in Nosir Khusrav district in Khation province of Tajikistan. The plant will be built by Lian Kayan Kanhia ("China Shuangji" or the "Company"), a leading producer of high-quality Portland cement in Shandong and Hainan Provinces in the People's Republic of China (PRC), announced that its Dongfang cement plant on Hainan Island, which it previously announced was on a published list of more than 2,000 production lines across China that the Ministry of Industry and Information Technology (MIIT) wanted to phase out due to concerns over outmoded production methods, has been granted a long-term extension of its operating license until after a new state-of-the-art 2,000,000 MT cement plant is completed and fully operational. "We have been working closely with both the Hainan government and PRC national authorities to resolve this matter so that it is mutually beneficial for all our stakeholders including our shareholders, employees, suppliers, customers, and also the people and businesses of Hainan Province who depend on our high quality cement for their construction needs. Everyone is very pleased by this outcome," said Mr. Wenji Song, Chairman and President of China Shuangji Cement, Ltd. "Under this agreement, we will be able to keep our Dongfang production line open, which has a current annual capacity of 500,000 MT, until after we have constructed a new modern cement plant." Mr. Song added, "We are presently negotiating with several banks and commercial funders to secure interest only loans for the money needed to build this new plant and are confident that we will be able to secure the funds on commercially competitive terms." Mr. Song continued, "Hainan Province is growing rapidly and has gained significant strength and prosperity with many new real estate projects and infrastructures projects being planned. Once completed, this new, state-of-the-art 2,000,000 MT cement facility in Dongfang, Hainan Province, will have an annual capacity 4 times greater than the capacity of the present plant. This will greatly assist us in our goal to become one of the top suppliers of high-grade bulk cement in China." Once this new plant is online and fully operational, China Shuangji's total annual production run rate will be roughly 4,500,000 tons which would roughly equate to $180 million in sales and about $15 million in profits. FLSmidth received an order from Siam Cement in Thailand for an air pollution control system for three cement lines at Siam Cement’s Thungsong plant. With the installation, Siam Cement will comply with new environmental legislation in respect of SO2 removal. The order consists of engineering, key parts, fans and supervision, and will be commissioned at the end of 2011. At Norcem Brevik, Norway, FLSmidth has used the patented GSA (Gas Suspension Absorbers) technology. The GSA combines a compact design with low operating costs and low emissions. The GSA is capable of simultaneously removing SO2, HCl, heavy metals (including mercury) and dioxins – all components for which the U.S. NESHAP rules apply. Recent measurements at Norcem Brevik have exceeded expectations to the performance of the GSA. The results were awaited by Siam Cement before they finally decided for the GSA, but with the results in hand Siam Cement was convinced about the GSA being their preferred solution, and the contract was concluded. The GSA has proven compliance with even the most stringent emission requirements. With these two orders FLSmidth has established the best reference platform for the GSA. No other supplier has similar references within this technology. It is thus an important step in ensuring FLSmidth's position within air pollution control and strengthens FLSmidth as a leading Cleantech supplier for the Cement and Minerals industries. FLSmidth has received its first order for a HOTDISC on the Indian market. The order for a HOTDISC along with an alternative fuel feeding system was placed by Vasavadatta Cements for their Unit III at Sedam and is an important order for FLSmidth as this HOTDISC project is going to be a first of its kind in India. At Vasavadatta Cements' Unit III, the FLSmidth supplied low NOx In-Line calciner kiln system already has provision for a HOTDISC. The HOTDISC is a safe, simple and effective combustion device that maximizes the substitution of fossil fuels by alternative fuels in a controlled and environmentally sound manner. The system to be supplied by FLSmidth consists of the latest generation HOTDISC with FLSmidth triple flap sluice as well as complete receiving, storage, dosing and transportation system for shredded and whole tires. A specially designed feeder system along with belt conveyors will be supplied for handling and transporting both shredded and whole tires simultaneously to the HOTDISC. This system will enable Vasavadatta Cements to feed 3.5 tph of tires and replace approximately 30 percent of the coal-fired in the calciner with alternative fuels. KHD Humboldt Wedag International AG (“KHD”) (Frankfurt Stock Exchange symbol: KWG) (OTC Pinksheets symbol: KHDHF), a global engineering, equipment and service company in the cement industry, announced today that it has entered into a strategic partnership with Beijing-based CATIC Beijing Co., Ltd. (“CATIC”), a subsidiary of China’s state-owned CATIC International Holdings Ltd., to capitalize on the rapidly expanding international market for the construction of cement plants. KHD’s Director Jouni Salo said that KHD and CATIC combined will be able to bid on a wider range of projects, including large turnkey projects, and penetrate the most important cement markets including – China itself, the largest single market in the world, and other countries and regions as KHD and CATIC see fit. · Leverage CATIC resources within China to win project awards. · Leverage the proven technological expertise of KHD. · Combine CATIC representation in more than 30 countries and 56 overseas subsidiaries with the traditional strength of KHD in India, EMEA, the Americas and countries of the former Soviet Union. · Penetrate or further strengthen our position in fast-growing emerging economies, including India, Brazil, Turkey and the petroleum-producing countries. · More effectively tap into the need of customers to manufacture cement locally, closer to its intended uses. Investment in KHD by a CATIC controlled Hong Kong company (“MGI”) in the range between €37 and €45 million. Method of purchase - Subscription from existing and unutilized subscription rights (in North America, it would be like a non-transferrable rights issue). Price - €4.53 per share. Closing to occur as soon as practical but no later than March 08, 2011. In the United States shares will be made available to accredited or qualified investors by way of a private placement. It is not the intentions to burden the company with the costs of compliance of Sarbanes-Oxley Act and the cost of continuous U.S. registration. The sixteenth Arab-International Cement Conference and Exhibition organized by Arab Union for Cement and Building Materials (AUCBM) was held between December 6 and 8, 2010 at Ras Al Khaimah Exhibition Center, U.A.E. The conference was inaugurated by H.H.Sheikh Saud bin Saqr Al Qasimi, Supreme Council Member and Ruler of Ras Al Khaimah. The three day conference was attended by 800 delegates from 355 companies across 27 countries. The conference focused on ways to achieve sustainable development in the cement industry on the backdrop of the current global economic scenario and showcased the latest technological developments in the cement industry. The event reflected the spirit of cooperation between the Arab countries and the rest of the world and provided an ideal opportunity for KHD to interact with manufacturers, suppliers and other industry players to exchange their expertise and explore new business opportunities in the sector for the Middle East Region. Mr. Ralf Slomski, Managing Director and head of KHD’s customer service center in EMEA along with Mr. Sultan Al Shawli, Deputy Minister for Mineral Resources, Saudi Arabia chaired the first day sessions. The KHD-Mertec stand was frequented by many visitors, customers with inspiring conversations. Mr. Ralph Slomski presented the KHD story with leading international publications - Global Cement, International Cement Review, Cemweek, ZKG International and World Cement. Representing the KHD’s knowledge edge, Dr.Stefan Seemann presented a paper on the COMFLEX® – Highly efficient and flexible comminution system, which was well received by the conference delegates. The KHD team also took time out to celebrate Dr.Stefan Seemann’s birthday at the KHD stand. The first KHD-Mertec cooperated event participation in the Middle East region was well received. KHD Delegate list included Ralf Slomski, Gaurav Sood, Stefan Kollen, Dr.Stefan Seemann, Volker Hellberg and Hans-Dieter Kozlowski. Find below the link to the paper “COMFLEX® – Highly efficient and flexible comminution system” presented by Dr.Stefan Seemann at the AUCBM conference. KHD Group has won major orders from India-based UltraTech Cement Ltd. for two cement lines, a member of the Aditya Birla Group, the eighth largest cement producer in the world. As a consequence of a long-standing and successful relationship between UltraTech and KHD, the two companies now agreed on new orders for two projects in India with a volume of EUR 85 million. This order will contribute to KHD’s earnings until commissioning begins in H2 2012. As a result, KHD Humboldt Wedag International AG lifts its guidance for order intake from previously EUR 260 – 280 million to now significantly more than EUR 300 million in 2010. The two projects contain pyro-processing lines with a nominal capacity of 10.000 tons per day (tpd) each and the connected roller press grinding circuits for raw material and for cement. In the last two years, KHD has supplied three 8.000 tpd lines to UltraTech and won orders for roller press grinding circuits. According to Jouni Salo, CEO of KHD, the acquisition success confirms the validity of the strategic shift towards the BRIC-states: “Today, more than 50 percent of our order backlog is generated in Russia and India. In this respect, we benefit greatly from our strong local presence and from the increasing urbanization and industrialization in these regions. Cement is a local business.” In the view of the management this trend will continue in the future so that the highest growth potential for KHD is expected to result from the emerging markets, especially China and India with nearly double-digit growth rates in the cement market. KHD is one of the major suppliers of cement manufacturing equipment with a base in India. With over 300 employees in India, KHD has brought the latest cement technology to India for over three decades. The company has made a major contribution towards achieving high technical standards for fuel and power consumption in Indian cement plants and has earned the respect and trust of the major local cement producers. UltraTech Cement Limited is the largest cement company in India with revenues of more than US$3 billion. It has operations in five countries with a total capacity of 52 million tons per year. A 5000 t/d NDP Cement production line of CIMPOR Cement (Zaozhuang) designed by Tianjin Cenemt Design & Research Institute (TCDRI), commenced operation on November 3. The project applies the advanced and mature technique of decomposition outside the kiln. Some of the electric equipment like the raw material vertical mill, preheater, cooler, limestone crusher, large bag dust collector in the kiln outlet, and DCS w supplied by TCDRI. CIMPOR Cement （Zaozhuang） Co. Ltd is affiliated to CIMPOR Cement Co. Ltd which is established jointly by Portugal CIMPOR Cement Group and the Ma clan in Macau. Currently, CIMPOR Cement Co. Ltd owns a 5500 t/d cement production line, three 2500 t/d cement production lines and two cement grinding mills in China. On September 27, a 5000 t/d cement clinker production line of Hubei Jinglan Cement Group, which is designed by Tianjin Cement Design & Research Institute, successfully ignited. Jinglan Group and TCDRI collarborated on three projects simultaneously, including Hubei Jinglan Project, Gansu Jinglan Project and Heibei Jinlan Project. equipment includes limestone crushing, raw material vertical mill, firing system and cement grinding system, are all supplied by TCDRI. The Gansu Jinglan Project and Heibei Jinlan Project were slated for operation at this time. Last summer new construction and expansion projects of two 4000 t/d cement production lines of Xinjiang Tianshan Cement Co., Ltd in Kashgar and Kargilik County were initiating and the foundations laid. Upon the completion, the production lines will add cement production capacity of 3.765 million tons to Tianshan Cement, which will further enhance the leading position of Tianshan Cement in Xinjiang market. The project in Kashgar is an expansion on the existed production line. The investment for the project is about RMB 680 million Yuan. Cement production capacity of the project will reach 1.8669 million tons upon the completion. The project in Kargilik County is a newly built project undertaken by the newly established Kargilik County Tianshan Cement Co., Ltd. The investment for the project is about RMB 705 million Yuan. Cement production capacity of the project will reach 1.898 million tons upon the completion. Upon the completion of the two cement production lines, cement production capacity of Tianshan Cement in Kashgar will reach 4.665 million tons and clinker will be 3.3 million tons. Tianshan Cement entered the Kashgar market in 2003. The first project — 300,000 t/y cement grinding mill commenced production in 2003 and the second project — 600,000 t/y cement grinding mill was put into production in 2004. In 2007 Tianshan Cement Kashgar started the construction of the 2500 t/d cement clinker production line and was put into production in January 2009. The two projects feature advanced technique, energy saving and emission reduction, representing the most advanced level in Xinjiang cement industry. Upon the completion, production capacity of Tianshan Cement in Kashgar and Kargilik County will rank the first in all of its cement markets, which could meet Kashgar’s needs of cement of superior quality and high performance. Last fall China National Materials Co., Ltd (01893•HK) announced that its interim results 2010 in Hong Kong. Turnover of 2010 H1 amounted to RMB 18,210 million, representing an increase of 45.48 percent as compared with that of the same period of 2009.Profit Before Tax amounted to RMB 1,654 million, representing an increase of 54.02 percent as compared with that of the same period of 2009. Earnings per share amounted to RMB 0.126, representing an increase of 45.28 percent as compared with that of the same period of 2009. Mr. Zhou Yuxian, President of SINOMA LTD, Mr. Gu Chao, Vice President and Secretary of the board, Mr. Wang Guanglin, Vice President and Chairman of Ningxia Building Materials Group Co., Ltd, and Mr. Wang Wei, Vice President and Chairman of Sinoma International Engineering Co., Ltd, attended the 2010 Interim Results Announcement. In the first half of 2010, SINOMA LTD actively took the advantage of the national policies like expanding domestic demand, accelerating transformation of the economic development patterns and structural adjustment. Leveraging on its advantages in strategy, technology and comprehensive competitiveness in the industry, SINOMA LTD expanded markets at home and aboard with all its strength and continued to push forward M&A in order to enhance the market share. At the same time. SINOMA LTD continuously made efforts in operation management and strengthened advantages in regional markets, products and service, which laid the foundation for the substantial growth of the interim results. During the first half of 2010, SINOMA LTD continued to actively explore domestic and overseas markets. The number of new orders for overseas cement projects clearly picked up and the number of domestic contracts reached a new high. The amount of new contracts in the first half of the year was RMB16.318 billion, representing a period-on-period growth of 52.96 percent. As at the end of June 2010, the amount of our backlog was RMB55.334 billion, which further consolidated our leading position in the market share. The abundance of reserved orders guaranteed the stable growth in revenue of the segment in the next few years. Mr. Zhou Yuxian analyzed that with recovery of the economy of emerging markets and reboot of credit market, cement demand would maintain growing. The trend of substantial increase in new orders of global cement engineering markets has appeared. It is expected that new capacity is mainly from Arica, Middle East, India, Brazil and East Europe. During the first half of 2010, SINOMA LTD further strengthened its ability to allocate project resources, enhanced its cost control and improved risk control ability to ensure the smooth implementation of projects under construction in a high-quality and high efficiency way. SINOMA LTD, being a leader of the industry, set its development target at the forefront, focused on its self-innovation and adopted a technology-oriented approach, endeavored to boost the commercialization of its technological achievement by further increasing its investments in research and development. SINOMA LTD developed a large number of new technology, new equipment that are widely used by cement production companies, thus making contribution to the development of the cement industry. In 2010 H1, the Lafarge Indonesia, Lafarge Uganda, Tanzania TCCL production lines constructed by the Company successfully commenced production. The Songtao EP project in Vietnam successfully passed the performance tests and acceptance checks; the RCC Phase II project in Saudi Arabia received the Provisional Acceptance Certificate (PAC); the production lines in Guizhou Wujiang, Yunnan Zhenkang, Tianrui Nanzhao, Sichuan Desheng, Sichuan Dongfanghong, Hanzhong Mianxian Yaobai were completed and commenced production successively; and the Kaisa Phase II clinker production line in Vietnam obtained the Final Acceptance Certificate (FAC) from the owner. 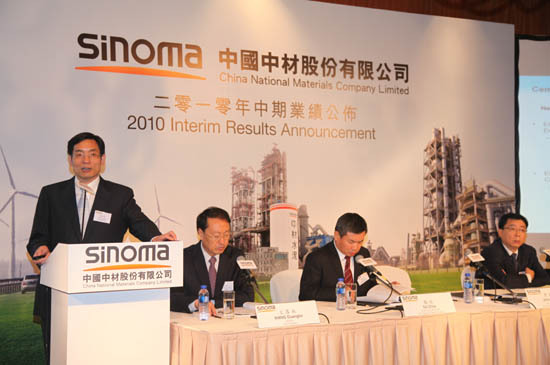 During the first half of 2010, demand in cement in the Northwestern China, the primary market of SINOMA LTD, continued to rise, and cement prices exceeded the national average and remained high. Moreover, the cement market in Guangdong improved compared to last year so SINOMA LTD took this favorable opportunity and increased its profitability. Results of the cement segment of the Company grew significantly in the first half of the year, with sales volume of cement and clinker of 18.281 million tonnes, representing a period-on-period increase of 69.98 percent. Its turnover amounted to RMB5, 209.63 million, representing a period-on-period increase of 65.98 percent. The segment results recorded a period-on-period growth of 61.54 percent. SINOMA LTD continued to carry out its strategies of maintaining its position as the largest cement enterprise in Northern China and as a regional leader, accelerated the pace of regional market integration and capacity expansion. Xinjiang Tianshan Cement Co., Ltd., a subsidiary of SINOMA LTD, completed its private placement of shares and reinforced its potential strength for development, laying a solid foundation for gaining additional market share in Xinjiang. Such measures further consolidated the leading position of SINOMA LTD in the cement market in Northwestern China. As at the date of this report, total controlled cement production capacity of SINOMA LTD reached 58.20 million tonnes, among which 6.20 million tonnes were newly added. The cement production capacity of SINOMA LTD in the Northwestern region reached 34.20 million tonnes. Meanwhile, 15 production lines of various scales were under construction or proposed for construction in the North region, and upon their commencement of production, will provide an additional production capacity of 18.70 million tonnes. Mr. Zhou Yuxian said that SINOMA LTD would take the opportunity of West China Development to accelerate the project construction and acquisition in this region. SINOMA LTD intends to further expand the production capacity in Norhwest China and makes sure that its cement output of 70 million tonnes can be reached by the end of 2010. Besides, SINOMA LTD places great efforts in energy-saving and emission-reduction in order to improve profitability. In 2010 H1, the pure low temperature waste-heat power generation projects constructed with six cement production lines commenced production, which had an additional waste-heat power generation installed capacity of 36MW. A total of 173.7996 million KWh of electricity was generated during the first half of 2010 and carbon dioxide emission reduced by 156,000 tonnes. Two clinker production lines that produce cement clinker from carbide slag and with a daily capacity of 2,000 tonnes will be put into production in Midong, Xinjiang in the second half of 2010. Upon completion and commencement of production in the second half of the year, it is expected that such two clinker production lines will consume over 1 million tonnes of industrial waste such as carbide slag per year. Compared to production of cement using limestone, this production method can reduce carbon dioxide emission by 600,000 tonnes per year and reduce production costs by more than 20 percent. More than 100 analysts and journalists attended the Interim Results Announcement in Hong Kong. SINOMA LTD President Zhou Yuxian briefed on the results of the company. India is the world's second largest producer of cement according to the Indian Cement Manufacturers’ Association. During September 2010, the cement production reached 12.54 million tonnes (MT), while the cement dispatches quantity was 12.56 MT during the month. The total cement production during April-September 2010-11 reached 81.54 MT as compared to 77.22 MT over the corresponding period last fiscal. Further, cement dispatches also witnessed an upsurge from 76.50 MT during April-September 2009-10 to 81.10 MT during April-September 2010-11. Moreover, the government's continued thrust on infrastructure will help the key building material to maintain an annual growth of 9-10 percent in 2010, according to India's largest cement company, ACC. In January 2010, rating agency Fitch predicted that the country will add about 50 million tonne cement capacity in 2010, taking the total to around 300 million tonne. Further, speaking at the Green Cementech 2010, a seminar jointly organized by the Confederation of Indian Industry (CII) and the Cement Manufacturer's Association in Hyderabad in May 2010, G Jayaraman, Executive President, Birla Corporation Ltd, said that in 2009, 40 MT of capacity was added and he expects a similar trend to follow this year. Cement and gypsum products have received cumulative foreign direct investment (FDI) of *US$1,971.79 million between April 2000 and September 2010, according to the Department of Industrial Policy and Promotion (DIPP). · Dalmia Bharat Enterprises plans to invest *US$554.32 million to set up two greenfield cement plants in Karnataka and Meghalaya. · Bharathi Cement plans to double its production capacity by the end of the current financial year by expanding its plant in Andhra Pradesh, with an investment of *US$149.97 million. 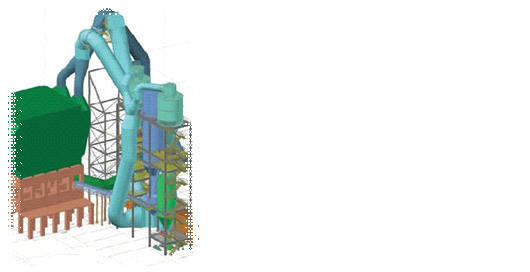 · Madras Cements Ltd is planning to invest *US$178.4 million to increase the manufacturing capacity of its Ariyalur plant in Tamil Nadu to 4.5 MT from 2 MT by April 2011. · My Home Industries Limited (MHI), a 50:50 joint venture (JV) between the Hyderabad-based My Home Group and Ireland's building material major CRH Plc, plans to scale up its cement production capacity from the existing 5 million tonne per annum (mtpa) to 15 mtpa by 2016. The company would undertake this capacity expansion at a cost of *US$1 billion. · Shree Cement, plans to invest *US$97.13 million this year to set up a 1.5 million MT clinker and grinding unit in Rajasthan. Moreover, in June 2010, Shree Cement signed a memorandum of understanding (MoU) with the Karnataka government to invest *US$423.6 million for setting up a cement unit and a power plant. *US$ 317.7 million will be used to set up a cement manufacturing unit with an annual capacity of 3 mtpa while the balance will be for the 100 mega watt power plant. · Jaiprakash Associates plans to invest *US$640 million to increase its cement capacity. The cement industry is pushing for increased use of cement in highway and road construction. The Ministry of Road Transport and Highways has planned to invest *US$354 billion in road infrastructure by 2012. Housing, infrastructure projects and the nascent trend of concrete roads would continue to accelerate the consumption of cement. Increased infrastructure spending has been a key focus area. In the Union Budget 2010-11, *US$37.4 billion has been provided for infrastructure development. The government has also increased budgetary allocation for roads by 13 per cent to *US$4.3 billion. Gujarat plans to treble its cement production capacity in three to five years. Proposals have been invited from cement companies such as ACC, ABG, Ambuja Cement, Emami, Indiabulls, Adani group, Ultratech and L&T and the state hopes to raise its capacity from 20 million tonnes per annum to 70 million tonne. The state will host the biennial Vibrant Gujarat Global Summit in January 2011 and expects to witness investment proposals worth *US$ 13.2 billion in the cement sector. *Exchange rate used: 1 USD = 45.42 INR (as of December 2010). Lafarge India announced the commissioning of a new Cement Clinker line at its Sonadih Cement Plant in District Raipur, Chattisgarh. With the installation of the new Clinker line, Lafarge India’s production capacity stands at 6.5 million tons of cement, which will further increase to 7.5 million tons after the completion of the grinding unit at Jojobera, Jamshedpur (Jharkhand). Lafarge is one of the major producers of cement in Eastern and Central India with its leading brands – Concreto and Duraguard. It currently has four cement plants in India: two plants in the state of Chattisgarh and a grinding plant each in Jharkhand and West Bengal. Lafarge has several green-field projects in the pipeline, which will expand its national footprint in the coming years. The global demand for cement continues to grow, as developing economies expand and need to augment their infrastructures. As with many commodity-driven industries, among the largest consumers of cement are the fastest-growing emerging economies, such as China, India, Brazil, the petroleum-producing countries, Turkey and the countries of the former Soviet Union. Global cement demand is forecast to rise by more than 4.1 percent per year to 3.5 billion tonnes, or US$246 billion, in 2013, according to the latest report by U.S.-based research company The Freedonia Group. The report, World Cement, said the rise will be driven by growing investments in infrastructure among developing countries, driven by economic growth and increasing per capita income levels. These three aspects have led the industry to be geographically and technologically diverse, and to establish an economic need to manufacture cement in relatively close proximity to its intended use, since transportation costs for a heavy commodity can negatively impact the cost at which it can be sold. India, the world's second largest cement market, will also see "some of the most rapid advances of any country in the world." Other fast-growing markets include the Philippines, Taiwan and Vietnam, all with growth rates exceeding 6 percent per year, and Turkey, whose growth rate was recently reported at higher than 10 percent per annum. In Western Europe, improvement in construction activity will fuel a turnaround in the region's three largest cement markets, Spain, Italy and Germany. Similarly, a modest rise in construction spending in Japan will drive increases in cement consumption after a long period of decline. As demand for locally produced cement grows the opportunities for KHD and CATIC increase; because the capabilities that the pair of companies offer are not commonly available. Most cement plants in the world are designed and erected by one of a handful of specialized engineering and construction companies, including KHD and CATIC. Cement plants are a market niche that is difficult for non-specialists to enter, because companies such as KHD have large libraries of intellectual property that may be difficult to circumvent. The processes used in making cement are rather specific to the industry, in spite of the fact that a variety of different raw materials may be used. For example, KHD’s trove of intellectual property has been in continuous development for over 150 years. The largest contracts for cement plant design and construction are typically awarded on a turnkey basis, with the EPC company handling all aspects engineering, procurement and construction (EPC), and then handing the completed and ready-to-operate plant to the buyer. KHD has in the past not concentrated on this area of the business, but has become one of the most notable companies in the world with regard to the technologies, equipment and services involved in cement-making. For the most part, the largest of these turnkey contracts have tended to be the domain of just two companies — Denmark’s FL Smidth and China’s Sinoma. The strategic partnership of KHD and CATIC has now created a third option for buyers, one that combines the impressive portfolio of KHD’s intellectual property with the strength and formidable turnkey experience of CATIC.